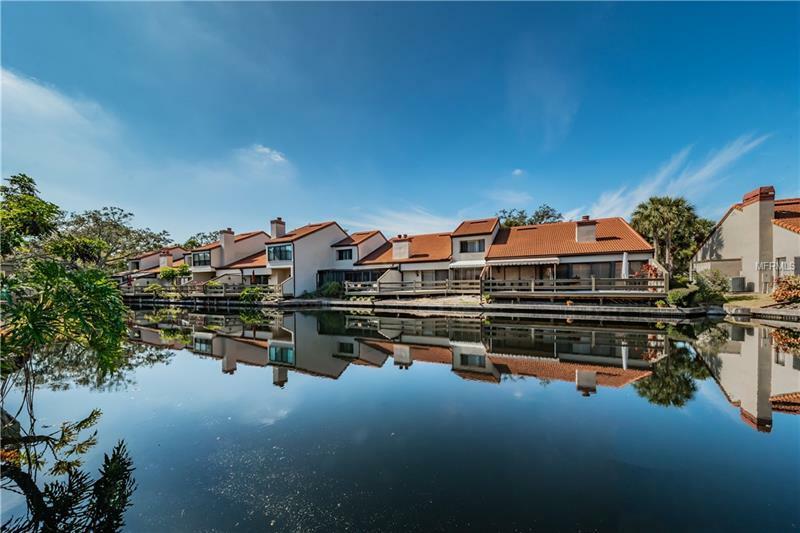 Extensively and impeccably updated, this 2 bedroom plus den or 3rd bedroom, 2 bath and 2 car garage offers a great Florida "Easy Living" lifestyle! Conveniently located in the desirable Braeloch Village +55 condos in Countryside. A new sunroom and deck overlook the private lagoon and add spacious areas for just relaxing or entertaining. This end unit has an open plan with high ceilings and reflects elegance without compromising comfort, great room and wood burning fireplace. Wood floors, plantation shutters, crown molding, decorator finishes, exquisite cabinetry, quality furnshings, a chef's dream kitchen - no expense spared in creating this beautiful home! Spacious and elegant master suite with plantation shutters, master suite with plantation shutters opens to deck. Luxurious updated bath has both tub and shower and walk-in closet. Guest bedroom suite has a gorgeous updated bathroom. Quality construction sun room offers a comfortable additional living space and great water views. A true turn key property with all furnishings included. Newer water purification system, washer and dryer, newer tile room, community pool and spa and near Countryside Country Club.